Seriously … Zoe Saldana as Nina Simone? *Are filmmakers at a loss of actors or just trying too hard? 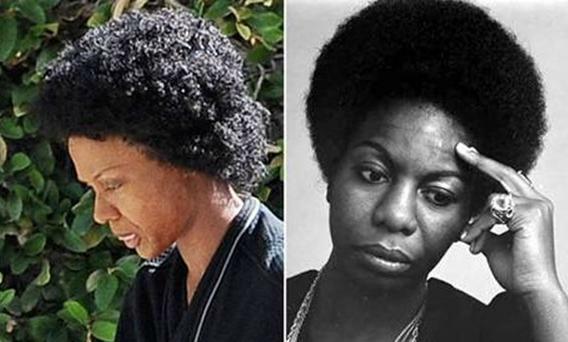 So Zoe Saldana was spotted sporting a terrible Afro wig and some bad makeup to play Nina Simone. Not to criticize Zoe, because the girl can act. But this just can’t be the right role for her. Does the public have a say so in the matter at this point? However, fans of the late singer produced a petition, hoping to get the filmmakers’ attention. “Playing Nina Simone could be one of the more definitive roles as far as biopics go–it’s not that Saldana isn’t a talented actress, but it’s hard to imagine there isn’t another Black actress out there who couldn’t evoke a better Nina,” writes Hello Beautiful. As I said before on a previous post, I like Zoe Saldana, she’s a talented actress as said in above column, but the part that’s troubling is this is same person that claims herself more on the Latina side than the black side. If you are mixed with both, then you are both, she may have always been like that but once Zoe arrived and she started getting all these roles especially Avatar, I just noticed she tries to run away from black and most of her leading men are white including the latest film she’s in. For someone who stated she didn’t want to be typecast in black roles nor considers herself ‘black’, why did she choose to do this role? This also came from someone who claimed that if black actresses couldn’t get work in Hollyweird, it was their fault. I don’t see anything special about her acting so I totally disagree about her skills. I’m a diehard fan of Dr. Simone and I will not be supporting this. I’m simply not willing to believe that this is true. Zoe is not a good actress for this role, let’s be real from her body of work so far she is mediocre at best, another actress who has the chops should of been considered. Zoe is just another pretty face and sadly hollywood is full of those. Zoe, I love you lil sister and I think you’re a damn good actress, but this one ain’t for you. It’s simply NOT believable – not at all. No way in hell can she portray Nina…no way!!! Didn’t she stated a few years ago she didn’t identify herself as a black person? As for acting chops – she can’t act in my opinion – just a beautiful face. * Octavia Spence – Strong 2nd choice!!!! and last, but no least….Kimberly Elise!!!! There you have – now get this list to the casting agent of this film. Dam, I should get paid for this!!!! Two more – the sista that does the Lysol commercials and the other one that does the Popeye’s chicken. Both are season actresses – just don’t know their names!!! You are so right Stephanie. I believe India Arie would be perfect for the part. I’m sure she couldn’t be any worse in acting than Zoe. Would someone please let me know what movie she played in where her acting was so great because I must have missed it. I commented a few weeks ago for a previous article on this topic – I thought the singer Estelle was a good choice in terms of Nina’s likeness..but I’m not sure she could act. Estelle and India.Arie are 2 excellent choices. If they some work on their acting I believe they could pull it off. Plus it always seems to be an easier transformation when singers go into acting instead of the other way around. After seeing a play on her life, she must be rolling over in her grave with Zoe Saldana being picked. Zoe is really not all that, PLUS Nina was a true soul sista and seemed very proud of her natural features…she was fierce and I will not be going to see this, at all…putting a dark face on a half breed, so/so actress…I’m good…Estelle would have EXCELLENT. If Precious could pull it off, then I know India or Estelle could do the same. Estelle with her British accent because Nina spent a lot of time in Europe and the Caribbean so that would have been perfect. This is just disappointing and very upsetting about the disrespect given to Nina, her family and her fans. I’ve seen Zoe act before and nothing really jumps out at me to make me believe she would be credible in this role. What about someone from Broadway? There are black actresses that are working on broadway and can sing. I am not familiar with their names though. What about the actress that played Whoopie’s part in Sister Act? She can sing as well. Unfortunately $ rule over substance. Whoever can bring the $ in gets the part. Does the person necessarily have to know how to sing? In What’s Love Got To Do With It, Angela Bassett lip synched the words to the songs. Even in death Nina Simone can’t get respect. I agree with whomever said Estelle or India Arie, YES!! The sad part of this is that this country literally chased Simone out of it. Now, these people want to make a buck off a person whom, in her day, was too controversial, too black and too strong. The fact she refused to compromised, costed her her career. I can totally understand her daughter being upset and disrespected by this. They seem like they want to focus on some sensational portion of her life by some caretaker. Who wants to hear what her caretaker thought? Simone wrote about her life in her own words. She doesn’t need a filter! That’s why this is nothing more than to revise her life, hollyweird style. I wish Nina would rise up and back slap these fools!